Windows Server Essentials (formerly Windows Small Business Server or SBS is an integrated server suite from Microsoft designed for running network infrastructure (both intranet management and Internet access) of small and midsize businesses having no more than 25 users or 50 devices. Application server technologies are tightly integrated to provide, e.g., the Remote Web Workplace, and offer management benefits such as integrated setup, enhanced monitoring, a unified management console, and remote access. Since the release of SBS 2003, the same service packs as those for Windows Server or other server products can be used to update the OS. Windows Server 2016 Essentials, based on Windows Server 2016 is the current version of Server Essentials, released in September 2016 with general availability October 12, 2016. Windows Server Essentials offers a flexible, affordable, and easy-to-use server solution for small businesses with up to 25 users and 50 devices. It can also be used as the primary server in a multi-server environment for small businesses. Windows Server Essentials makes it easy to transition to cloud computing when you’re ready. READ ME: Please take a look; you are purchasing a product from here means you purchased the digital version(download version) of that product. After receiving the payment we will send you a simple text mail with a Brand New License Key(which will be issued after the sale only for you) and official Microsoft hosted download link for the purchased product. Please read our and Microsoft terms & conditions before buying: Sales T&C. Delivery time within 30 minuses to 12 hours. Depends on business hours and the work load. You are purchasing the Digital version of Windows Server on here, so nothing will be shipped physically, after receiving your payment we will send you a 100% Genuine & Brand New Windows Server License Key(Retail) and a download link for the purchased product by a simple TEXT mail. Your download link source will be Original Microsoft download server link. It's guaranteed you to get the 100% authentic product to download securely from Microsoft. The Windows Server 2016 licensing model includes both Cores + Client Access Licenses (CALs). Each user and/or device accessing a licensed Windows Server Standard, Datacenter or Multipoint edition requires a Windows Server CAL or a Windows Server and a Remote Desktop Services (RDS) CAL. A Windows Server CAL gives a user or device the right to access any edition of Windows Server of the same or earlier version. Each Window Server CAL allows access to multiple licenses of Windows Server. After the General Availability of Windows Server 2016, the business model for Standard and Datacenter editions will transition from processor-based to corebased licensing. Core-based licensing provides a more consistent licensing metric across multi-cloud environments, improves workload portability for Windows Server through benefits like Azure Hybrid Use Benefit, and helps remove friction across different licensing models. The Windows Server 2016 licensing model includes both Cores + Client Access Licenses (CALs). Each user and/or device accessing a licensed Windows Server Standard, Datacenter or Multipoint edition requires a Windows Server CAL or a Windows Server and a Remote Desktop Services (RDS) CAL. A Windows Server CAL gives a user or device the right to access any edition of Windows Server of the same or earlier version. Each Window Server CAL allows access to multiple licenses of Windows Server. After the General Availability of Windows Server 2016, the business model for Standard and Datacenter editions will transition from processor-based to corebased licensing. Core-based licensing provides a more consistent licensing metric across multi-cloud environments, improves workload portability for Windows Server through benefits like Azure Hybrid Use Benefit, and helps remove friction across different licensing models. Datacenter: Provides all new features as Storage Spaces Direct, Storage Replica, Software-Defined Networking Stack, shield Virtual Machines and so on. Thanks to this edition you can run unlimited virtualization workloads. Standard: This edition provides limited features (no Storage Spaces Direct for example) and limited virtualization. If you don’t need to build a server based on storage or Hyper-V, this edition is for you. Business Essential: this edition is designed for small business under 50 users. Below you can find the difference between Datacenter and Standard Edition and the pricing for 16 Cores. Microsoft has changed the license model to Core model. For each 2 physical cores, you have to buy a license pack. To use Windows Server 2016, you have to buy at least 8 license packs that cover 16 physical cores. Microsoft also has announced that to use a Nano Server in production, you must subscribe to Software Assurance. It is important to understand the two servicing model available depending on the installation option. 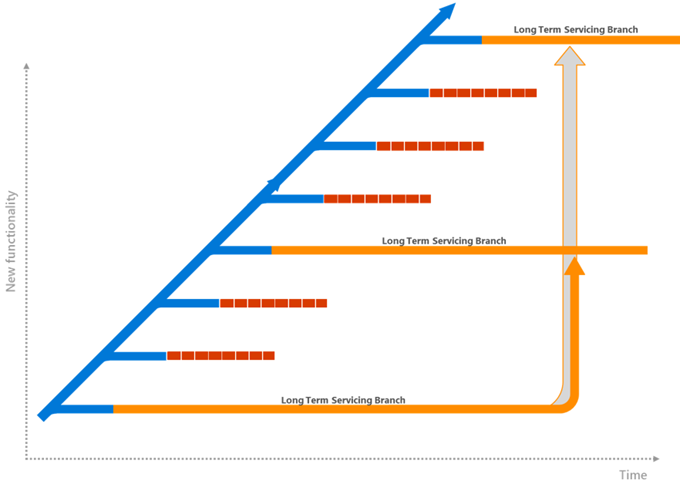 The Long Term Servicing Branch (LTSB) is the same model that we have had so far. When Microsoft released Windows Server, they provided 5 years of mainstream support and 5 years of extended support. The provided features were frozen in the time until the next Windows Server release. This is what LTSB provides. 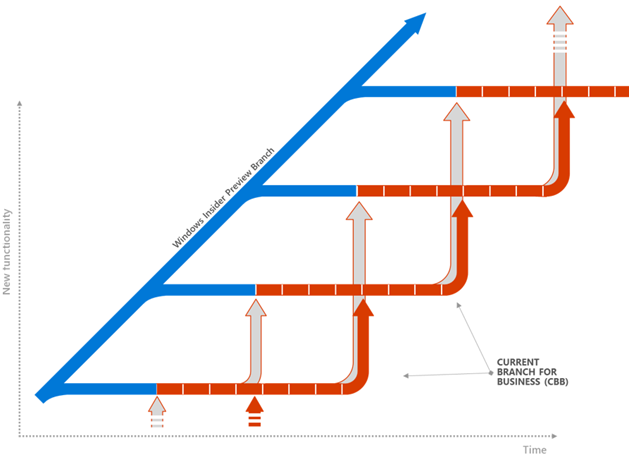 Since Windows 10, Microsoft has developed a new servicing model called Current Branch (CB). Regularly (almost every 4-6 months) Microsoft provide servicing updates to Windows 10 to bring new functionalities and “force” to upgrade the build version. For companies, build upgrade imposed by CB is too recurrent so they need more time. Administrator can choose the Current Branch for Business to postpone the build upgrade for an additional time of 4 to 6 months. This is what is the Current Branch for Business (CBB). The server with Desktop Experience is Windows Server 2016 with the GUI deployed and Server Core is Windows Server 2016 without the GUI installed. As you can see in the above table, these installation options support only LTSB servicing model. However, Nano Server can be only in the CBB servicing model. Before this announce, I have spent a lot of time on Nano Server to understand and to explain how to deploy Hyper-V and Storage Spaces Direct node with this kind of installation option. In my opinion CBB is not a cool servicing model for this usage and I think I will not recommend Nano Server for this kind of deployment. It’s a shame because Nano Server brings a lot of advantages for Hyperconverged node. I’m a little disappointed by this news. It is out of the scope of this topic, but System Center 2016 should be officially launched at the Ignite conference as Windows Server 2016.